Enjoy healthy, clean water with our Basic filtration. Our unique, premium carbon water filter is certified to reduce lead, mercury, chlorine (taste and odor) and many other contaminants. It also removes 96% of trace levels of pharmaceuticals. Yet it still leaves behind beneficial fluoride. Enjoy clean, great tasting water right from your tap. MAXION filter technology is PURs unique formulation approach for blending carbon and ion exchange materials for maximum contaminant reduction. Clean drinking water is the foundation for good health. 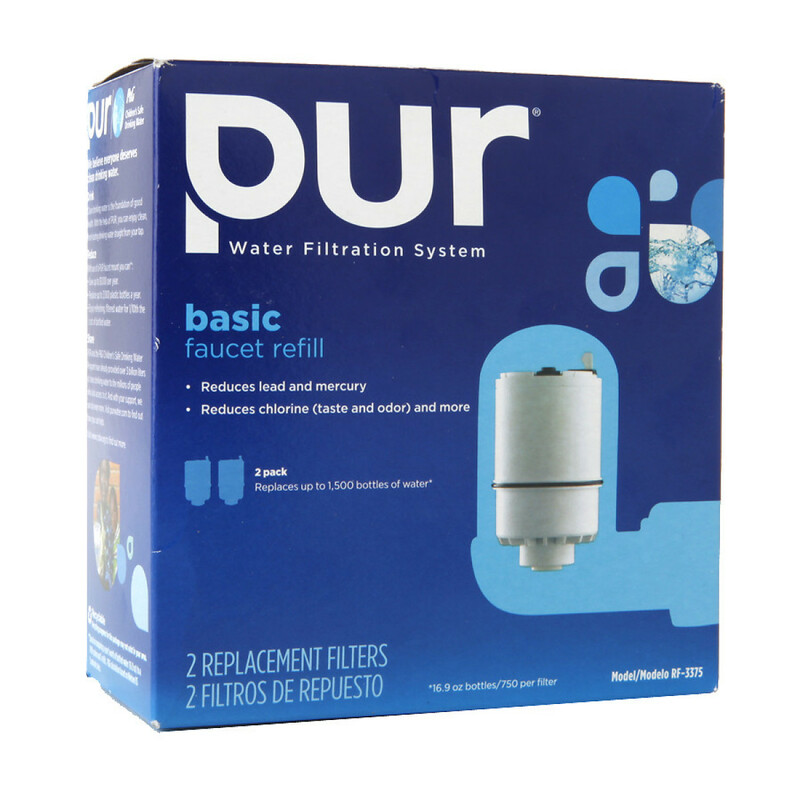 PUR faucet water filters with MAXION technology turn your ordinary tap water into clean, fresh-tasting drinking water. 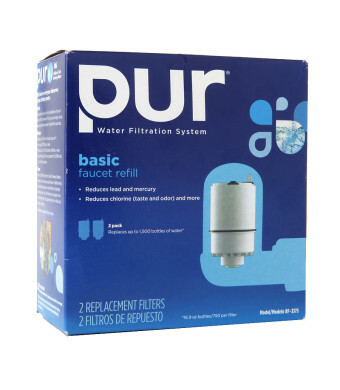 This is a 2 Pack of PUR Faucet Mount Replacement Water Filters Basic. Enjoy healthy, clean, great-tasting water. Our unique, premium carbon filter is certified to reduce chlorine (taste and odor) and many contaminants including lead and mercury. It also removes an average of 99% of trace levels of pharmaceuticals. * Yet, it still leaves behind beneficial fluoride. Enjoy clean, great-tasting water right from your tap. We believe everyone deserves clean drinking water. Clean drinking water is the foundation of good health. With the help of PUR, you can enjoy clean, fresh-tasting drinking water straight from your tap. Save up to $1,000 per year. Replace up to 3,000 plastic bottles a year. Enjoy refreshing, filtered water for up to 1/10th the cost of bottled water. PUR and the P&G Children's Safe Drinking water Program have already provided over 3 billion liters of clean drinking water to the millions of people who lack access to it. And with your support, we can do even more. Filters 100 gallons/1,600 8 oz cups per filter, lasts up to 3 months. All PUR faucet refills fit is all PUR faucet mount systems and the Oster Chill & Filter Powered Water Dispenser. The contaminants or other substances removed or reduced by this water filer are not necessarily in all user's water. Do not use with water that is microbiologically unsafe or of unknown quality without adequate disinfection before or after the system. Systems that are certified for cyst reduction may be used on disinfected water that may contain filterable cysts. Individuals requiring water of certain microbiological purity should consult their physician. Tested and Certified by NSF International against NSF/ANSI standards 42 and 53 in all PUR faucet mount systems and the Oster Chill & Filter Powered Water Dispenser for the reduction of claims specified on the Performance Data Sheet. Conforms to NSF/ANSI 53 for VOC reduction. See Performance Data Sheet for individual contaminants and reduction performance. The ADA (American Dental Association) Council on Scientific Affairs' Acceptance of PUR model RF-3375 is based on its finding that the product is an effective water filter that does not remove fluoride from tap water. The ADA endorses community water fluoridation as a safe, beneficial, and cost effective public health measure for preventing tooth decay. *Pharmaceutical reduction is not certified by NSF/ANSI or state standard. Based on manufacturer testing for average reduction in trace levels of 12 pharmaceuticals. **Based on comparing a year's worth of bottled water (16.9 oz) to a PUR system and 3 refills. P&G calculation based on Nielsen US Scantrack sales. For best performance, change your filter every 3 months. See owner's manual in box for details.